World leaders, along with thousands of participants from governments, the private sector, non-governmental organizations (NGOs) and other groups will come together from June 20 in Rio de Janeiro, Brazil, to take part in the UN Sustainable Development Conference (Rio+20). The Conference aims to shape how countries and their citizens can reduce poverty, advance social equity and ensure environmental protection to achieve long-term growth. Seven key areas have been identified by the UN as needing urgent attention: creation of jobs, access to energy, building sustainable cities, ensuring food security and sustainable agriculture, access to water, managements of oceans and disaster readiness. But what do each of them entail and how can people contribute to a sustainable future? UN officials tell us more about each area and how we can contribute to make our planet more sustainable. Andrew Hudson, the head of the Water & Ocean Governance Programme of the UN Development Programme (UNDP), spoke about the importance of regulating the shipping industry, choosing fish in the supermarket, and why microscopic plankton may be the most important organism on Earth. How do oceans fit into the sustainable development picture? Andrew Hudson: Well, every time you take a breath, you should know that half of the oxygen is produced in the oceans – it is actually produced by the plankton. Many people don’t realize that. At the moment, the oceans are facing a number of very serious challenges and those challenges not only affect the environment. They also affect and threaten economic services that depend on oceans, and that, of course, ultimately threatens people’s livelihoods and their security, food security, job security and so forth. So, having oceans part of Rio is a really fundamental aspect of the conference. What are the most pressing issues that governments need to act on regarding oceans? Andrew Hudson: The key challenges the oceans face are numerous, but some of the most important are: overfishing, pollution – in particular the so-called nutrient pollution which comes from untreated waste water – invasive species that move from one part of the ocean to another through the ballast water of ships, and ocean and coastal habitat loss such as mangroves, sea grasses, and coral reefs which are declining every year. Lastly, and this is a new aspect of the climate change issue, there’s ocean acidification, which occurs when carbon dioxide (CO2) in the atmosphere dissolves in seawater making it slightly acidic. As we build up the CO2 in the atmosphere, the oceans absorb about 30 percent of it, and over time we are already seeing that oceans are getting more and more acidic; and if we don’t change our pathway, this could actually start to affect certain organisms in quite serious ways. What impact does ocean acidification have on other ecosystems? Andrew Hudson: Well, quite a bit actually.The organisms that fix calcium carbonate – which are a large fraction of the organisms in the oceans such as shells and shellfish, but also microscopic organisms which are the basis of the food chain in the oceans – might face increasing acidification. If the acidity gets too high, they can no longer fix the calcium carbonate into their shells, they will literally dissolve, and then the potential impacts on ocean ecosystems are quite worrying, because the plankton are the foundation in which the rest of the ecosystem is built – the lowest level in the ecosystem, and if they’re not surviving and prospering everything above them will suffer as well. Are there any activities underway which help ensure that oceans are managed in a sustainable way? Andrew Hudson: It isn’t all gloom and doom. There are some success stories, which is very important because that gives us hope and promise for replicating things that work to address these issues at a larger scale. A very good example where something is working is in the issue of invasive species, which are microscopic organisms that are pumped into ships’ ballast water when it is unloading cargo at a port, and then the ship may travel halfway around the world, say from Shanghai to New York, carrying that ballast water. When it unloads new cargo at a new port, it will also unload that water. It may be a long journey and most of the organisms are trapped in the dark in very bad conditions and will not survive the journey. But every once in a while, an organism survives and it’s not a native organism so it can actually establish itself and, in a few cases, overwhelm the ecosystem they’ve been introduced to. This happened in the Black Sea with Comb Jellyfish. Invasive species can cause billions of dollars in damage and completely impact the ecosystem. So the shipping industry, working with the UN, the International Maritime Organization, UNDP [UN Development Programme] and others have taken quite serious steps on this issue by adopting the global convention on ship ballast water in 2004, and calling for very specific management and treatment measures to ensure that that ballast water is no longer going to be transporting these invasive species. As that process ensues in the next few years, it will actually have a significant impact in reducing risks to oceans by reducing this transfer of these invasive species. That’s a very positive step in the right direction. Another example has to do with pollution issues and nutrients. One of the world’s most significant hotspots for this issue of excess nutrients into the oceans was also the Black Sea. In the late 1980s, mainly due to the huge build up in the green revolution application of fertilizers, growth in livestock farms, etc. the Danube River was transporting massive quantities of these nutrients into the Black Sea and this leads to an issue called hypoxiam – which is basically when the system gets so overwhelmed with production that bacteria consume that excess production and in doing so consumes the oxygen of the water, and the water can become either oxygen-free or with very low oxygen, and that’s not good for most of the organisms there. The Black Sea entered a serious period of hypoxia where thousands of square kilometres of the northwest portion were hypoxic. So what we did over a 15 year period was work with the 17 nations around the Black Sea – the two comions that were merging for the Danube River in the Black Sea, the UN system, the World Bank, the European Union and many other partners – to help the countries put together a plan and a long-term vision and programme to begin to reduce these pollution impacts. And what we found over time is that by changing agricultural practices, by investing more in waste water treatment, by implementing certain industrial reforms, we have now seen a start in meaningful reductions in the amount of pollution that’s reaching the Black Sea, and the good news is that the hypoxic zone has largely been eliminated. There are now known to be over 400 of these hypoxic zones in the world, and it’s still increasing, so the problem is getting worse and yet we do have a good example of what might work in terms of collective efforts of governments of industry, of consumers also, working together towards a solution that can deliver results. What can members of the public do to contribute to the sustainability of oceans? Andrew Hudson: Consumers are involved in the choices they make in the use of fertilizer on lawns for example. Some parts of the world have banned phosphorus, one of the big culprits of pollution in coastal areas, such as here in New York City. People can reduce the use of fertilizers in their property. They can also get involved with the issue of overfishing. Half the world’s fish stocks are at their maximum allowable exploitation. A quarter are overexploited or depleted, which means that more fish have been taken out that the system can maintain, and maybe a quarter or less are healthy. There are increasing efforts by a number of non-governmental groups to identify fish species and fish stocks that are fished sustainably, and one thing a consumer can do is to be aware of which fish you see in the supermarket and whether it’s considered to be fished sustainably or not. There was a very recent and very admirable decision by The Whole Foods Market to specifically only purchase seafood that has been certified by a number of bodies as sustainable. That’s a very important step that involves both the industry but also the consumer. 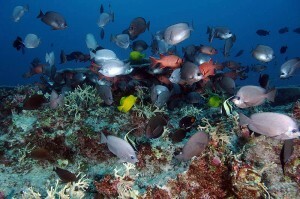 Is there a specific goal for Rio+20 regarding oceans? Andrew Hudson: Well, obviously it’s still a fluid situation as the outcome document is still being negotiated. The good news is that, from the outset, oceans appeared quite prominently very early on the zero draft outcome document and that was a very good sign. Most of the key issues are highlighted from that stage and remain in recent versions, but of course the real outcome that we hope to see is specific commitments to new initiatives or enhanced approaches to existing initiatives. There are a lot of programmes in place to address some of the issues discussed. Some of these are making progress, but it more is needed. One of the underlying aspects of all the issues I mentioned, and really the whole ocean picture, is that it’s fundamentally what’s known as a ‘market failure.’ The markets are not quite right, in different contexts. For example, in fisheries, you see roughly a $20-30 billion a year flow to the fisheries industry in subsidies, mainly on things like cheaper fuel but also in low interest loans. Unfortunately, subsidies can be good, but they can also be bad as well, and what has happened is because of these subsidies in particular, most of the fishing industry has become over capitalized – that is, there are too many boats catching too few fish and so that would be a key step, to find mechanisms to move toward the reduction of subsidies to non-sustainable fisheries while at the same time respecting and reflecting the needs of the poorest who catch fish for food. Ocean acidification is the classic [example] of an externality, the externality being carbon dioxide. Of course, the only way to internalize that externality is to put a price on carbon to send the right economic signals to the energy markets to move toward a low-carbon economy. Then we would see the benefits, not only in slowing down the impacts of climate change but also the impact of ocean acidification. Can the world address issues such as ocean acidification without compromising economic growth? Andrew Hudson: Absolutely, and this is what happened in the case of the invasive species. Because of the expectation of a new global legal regime on what big ships must do once the convention [on ship ballast] comes into force, the estimation is that investments are going to be up in the $30-35 billion range. This is internalizing the externality, passing the cost of creating clean ballast water to the shipping industry. What was amazing about the ballast water process was that the shipping industry was supportive and at the table from the start, and to this day, and one of the reasons was that until this convention came forward different countries were applying different standards and this was confusing, difficult and costly. Everyone knows that the private sector likes a level playing field and shipping is a truly global industry. In the grand scheme of things, the costs are pretty small, and the industry can easily absorb these them. What’s exciting is that this global legal mechanism created a completely new industry that didn’t even exist ten years ago which is the treatment of ballast water. Some companies have already invested more than $100 million in research and development and technology for this issue. Policy and, in this case, global legal new mandates aren’t necessarily bad for the economy because they create huge opportunities in other areas. Oceans cover three quarters of the Earth’s surface, contain 97 percent of the Earth’s water, and represent 99 percent of the living space on the planet by volume. Over three billion people depend on marine and coastal biodiversity for their livelihoods. Globally, the market value of marine and coastal resources and industries is estimated at $3 trillion per year or about five percent of the global gross domestic product. Ballast water: Large ships often take on extra water into their ballast tanks to maintain stability when transiting in the open ocean. The water may be discharged when the ship gets into a new port, discharging new organisms in the water along with it. Hypoxia or oxygen depletion: A phenomenon that occurs in water environments as dissolved oxygen quantities diminish in concentration to a point that it negatively affects aquatic organisms. Most fish cannot live below 30 percent of dissolved oxygen saturation.